With the launch of iCloud, specifically iTunes in the Cloud, it means that all purchases made on iTunes is now been saved in the cloud (Internet) at Apple’s server. iCloud allows all purchases through iTunes to be shared and synced with all iOS devices and computers that the customer owns automatically and instantl. 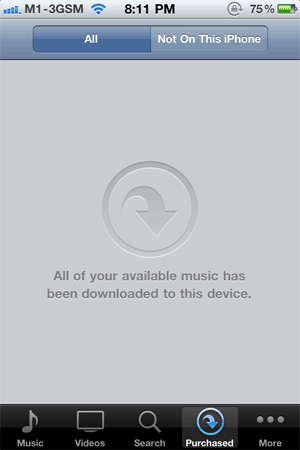 Previously all customers’ purchases can be synced to other iOS devices only by connecting to iTunes software. The good thing about iTunes in the Cloud is that now all your past and previous purchases from iTunes is now readily available for viewing, and downloading if you want. Before iCloud era, iTunes Store customers have to check unintuitive purchase histories inside “Account Information”, which does not allow interaction nor direct download from the history. Here’s how you can view and manage all iTunes purchased items of music, apps and books in the iCloud, and initiate manual downloading if the content not yet available on that device. Note that iCloud Automatic Downloads only applicable to new purchases, so if you have any past purchases that not yet synced to the device or computer, you have to manually download previously purchased music (songs), apps and books from the cloud, for free. 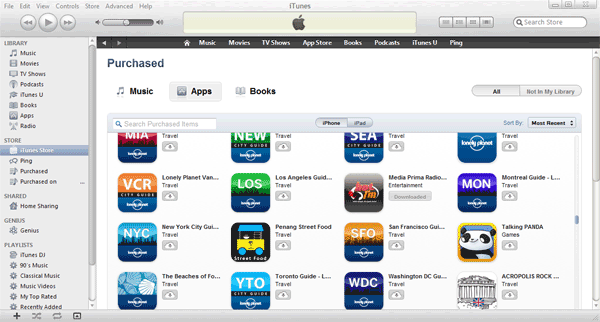 In iTunes, click on the Purchased in the left sidebar under Store section. Then click on Download Previous Purchases in the bottom right corner. To initiate download, just click on the Download from iCloud icon. Unlike iTunes, each type of content (music, apps and books) is managed by individual apps on iOS devices of iPhone, iPad and iPod touch, namely iTunes app, App Store app and iBooks app. Thus, in order to re-download previous purchases on iOS devices, different apps have to be opened. All iOS 4.3.3 powered iOS devices is automatically updated get the download from iCloud for past purchases feature, through OTA (over-the-air) update pushed by Apple to add a new Purchased tab to these apps. 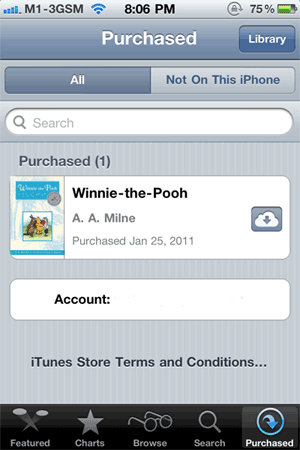 Books: Open iBooks, and go to Store -> Purchased. 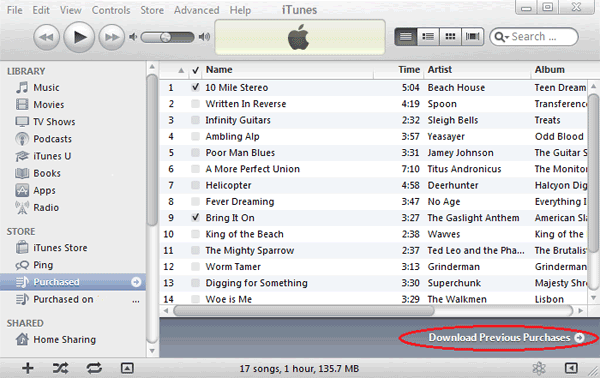 Music: Open iTunes, and go to Purchased tab. Apps: Open App Store, and go to Updates tab. 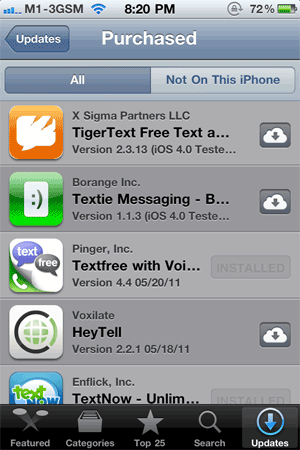 Tap on Purchased to get a list of all purchased apps. In all apps, user has the option to view all previous purchases, or only view past purchases that are not yet already on the device. Simiarly, to initiate download, just click on the Download from iCloud icon.